In this section i will be posting scientific DNA studies relating to the African origins of the Afro-Diaspora as well as illuminating the genetic diversity found within Africa itself. Via the drop-down menu or these direct links below you can browse through them as i have already arranged them according to populations being studied. I will add new ones after also posting them on the main blog. Haplogroups (Y-DNA, mtDNA) only represent a very minimal portion of your total ancestry and often date back from many tens of thousands years ago. Far outside a normal genealogical timeframe (~500 years) therefore. In fact most people sharing your own haplogroup will be very distantly related to you, often not detected by DNA testing companies because the shared DNA segments will be tiny and below their reliability threshold! Autosomal DNA testing is the only way to find out about your complete ancestry. See figures below for visualization although generally speaking you will have to go back more generations than just 3 or 4 to find out about your complete African ancestry. In fact you will have to trace back to your first African born ancestor carrying your haplogroup in a direct maternal or paternal line to determine the relative contribution of that haplogroup to your ancestry. For African Americans this could take you back at least 7 generations on average to the mid 1700’s when most Africans arrived in the US (see “From African to Creole“), but in some cases it might also take you back right to the 1600’s! Going with a conservative estimate you could have 128 ancestors around 1750 but in the 1600’s this will have increased exponentially to 1024! 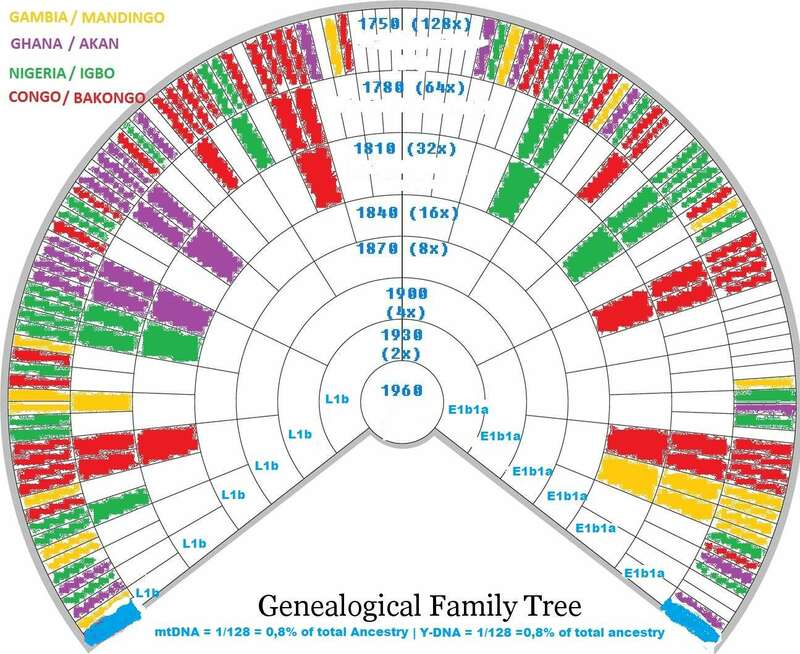 (see this link for a useful overview of the number of ancestors per generation). Of your dozens or even hundreds of African-born ancestors relocated to the US, your direct maternal/paternal ancestor would be only one, representing no more than 1% of your total ancestry, in most cases (see also “Fictional Family Tree incl. African Born Ancestors“). A minority of African Americans get tested with non-African haplogroups, a further proof that only autosomal DNA can tell you about your complete ancestry. As the greater part of African Americans will obviously still be predominantly African depite having a non-African haplogroup. Theoretically speaking even a person who scores 99% African in a DNA test could end up with a non-African haplogroup! These haplogroups are most often testimony of minor European geneflow among the African American population but in a few cases also Amerindian geneflow is reflected in haplogroups. Interracial unions usually involved European American males as measured by European Y-DNA but a considerable % of African Americans also carry European mtDNA. This is unlike most other Afro-Diasporic populations, thereby constituting a distinct feature of African American genetics i suppose. According to several studies it’s in between 8-10% (e.g. Stefflova et al. 2009. or Deason et al. 2012). Which might imply that generalizations about the nature of European admixture do not always apply as we all have individual family trees. Even if you personally do not have a European maternal haplogroup you could still have a European maternal ancestor through either your paternal family lines or those through your maternal grandfather, your maternal greatgrandfathers etc. Genetics is a quickly developing field of science. DNA studies can only represent the current state of knowledge. A major research paper published only a few years ago already runs the risk of becoming obsolete. It’s always advisable therefore to check for the current relevance of any particular DNA study and to which degree it might already have become outdated. For instance is its methodology or the DNA testing software being applied up to the latest standards? Sampling bias: how representative are the sample groups being used in the study? As measured by sample size, distribution of regional/ethnic origins, socioeconomical status etc. etc. Research bias: do the authors seem to be singling out only whichever evidence supports their research agenda? DNA studies are naturally focussed on the technical aspects of whatever they are researching. However genetics is embedded in the social sciences as well, especially the history of population migrations. I often find that DNA studies can be faulty in providing an accurately detailed historical framework and sometimes the historical details being mentioned can even be plain incorrect! Which often results in akwardly formulated conclusions. It’s advisable therefore to always check the historical references being given and just to be informed about such matters yourself as well of course. Ancestral components are often named after ethnic groups which were sampled and used in the analysis, these potentially misleading labels are NOT per se an indication of actual descent but rather of genetic affinity with the samples. It’s a common “newbie” mistake to take ancestral category labels literally. This new field of science is still improving itself. Research results are therefore not to be taken as anything final. At least not when it comes to the percentages, the overall analysis can still be generally correct but of course only to be determined after a careful reading and pending new research insights.